$0.99 (regularly $2.99) 5/23/2017 - 6/1/2017! Do you struggle with procrastination? Do you often feel overwhelmed by postponed tasks and looming deadlines? Imagine completing tasks and projects with plenty of time to spare. Imagine living a stress-free life because you're getting things done. Imagine doubling your output, maximizing your time, and achieving your goals! 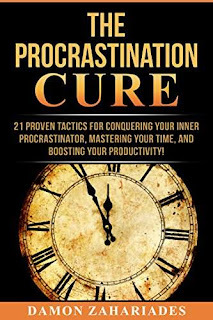 The Procrastination Cure shows you how to make fast decisions, take quick action, and get more done in less time. Use this simple, step-by-step system to finally overcome your inner procrastinator and catapult your productivity!